Jersey is an island shaped by the sea, where things are revealed – to any who choose to look. Enter a world where the ocean disappears to the horizon and we are all visitors. 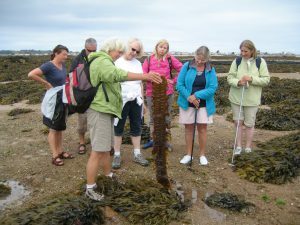 Explore rock pools, cross sand bars and gullies on a guided walk into Europe’s largest rocky intertidal zone. 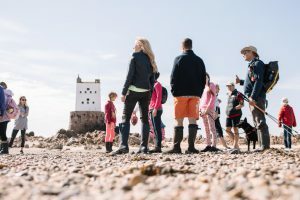 Discover Jersey’s very own wilderness with expert local guides who have explored this wonderful coast for many years. Revel in the stillness and expanse of an area that is covered twice a day by some of the highest tides in the world. Here marine life must survive the extremes of water pressure and being marooned high and dry for hours out of the ocean. Our walks to these towers are sometimes called “moonwalks”. 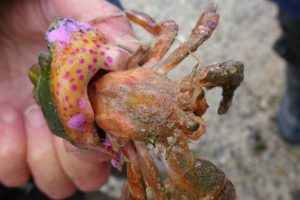 Though the landscape might look barren, it’s teeming with marine life and has a rich maritime history. It is an internationally recognized Ramsar Wetlands site – a marine version of the Jersey National Park. “Moonwalks” to Seymour Tower take place at low tide during the day, some at night. Prices from £16 (under 18 years £8) Dates. 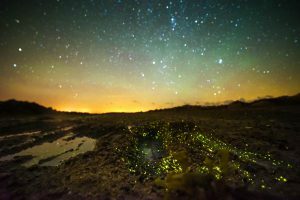 Join us on an evening walk in search of tiny creatures which glow in the dark like fireflies or glow worms. Bring the sea to your kitchen. Jersey has more than 200 species of seaweed, some of them tastier than others, all of them healthy, great to bake or to use as condiments in your cooking. 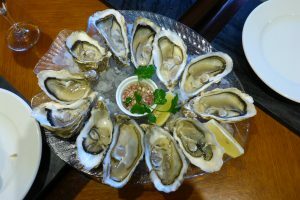 Walk among the oyster and mussel beds in the Royal Bay of Grouville followed by the opportunity to sample delicious fresh Jersey Oysters. £18.50 (under 18 years £9). Dates. 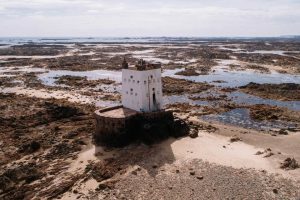 For the more adventurous we can arrange day and overnight stays in the historic Seymour Tower, completely surrounded by the ocean at high tide. Travel by charter boat to Les Écréhous and explore the island with a local guide. We’ll reveal the hidden secrets of this Jersey jewel. Enjoy the exceptional nature of this miniature world that is part of the Jersey National Park. Les Ecrehous dates and information. In the past, Jersey folk called it low water fishing. Today it’s called foraging. Whatever the name, join us on a marine wild food foray as we stroll down to the biggest oyster beds in the British Isles. We’ll reveal what you can forage from the sea and share stories of the 19th century Oyster fishing, Jersey’s gold rush. Walk dates and Online booking. French and German commentary possible, if reserved in advance. Individual, group and private bookings. Contact us. Discover places, stories and experiences you might easily miss by hiring a professional English and German speaking tourist guide. Join Trudie Trox, travel guide book author and professional tourist guide with over 30 years experience on your Jersey discovery. Half day, day, and multi-day itineraries can be arranged as well as guided trips to the other Channel islands. Email Trudie.